Well… I am thrilled to be able to introduce you to my new venture, The Learning Zoo, and to my new colleague – Jeffrey the Giraffe! The Zoo will offer in-service training and conferences in Reflective Reading (formerly Muckle Reading) as well as offering downloadable resources, lessons and advice. In addition, The Teaching Trunk provides a space for teachers to share and steal each other’s Muckle Reading / Reflective Reading Task Maps and Textplorers activities – to save everyone time! To celebrate the launch of The Learning Zoo, every day on the blog until Christmas, there will be competitions, prizes, book giveaways and free lesson downloads as part of Jeffrey the Giraffe’s Advent Extravaganza! 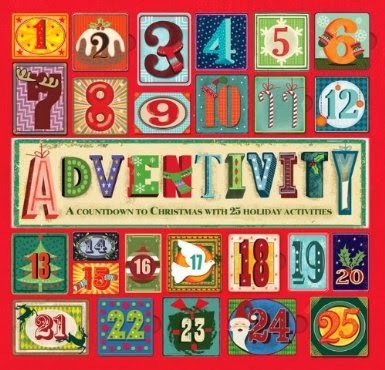 Today’s prize is a lovely, appropriately festive book called ‘Adventivity’. Packed with arty ideas and Christmassy crafts, there’s something to do for every day of Advent. Ideal to give you new ideas for Christmas fun in the classroom – or perfect to keep the early finishers occupied this month! To be in with a chance of winning this lovely book (RRP £12.00) all you have to do is say hello to me and Jeffrey in the comments below. I’ll let Jeffrey choose the winner – and we’ll announce it at 10pm tonight. Good luck – we look forward to hearing from you! Good morning Anne and Jeffery. Good evening Anne and Jeffery! Well, it’s that time of the night – a winner has been chosen at random by Jeffrey… congratulations to Amy – you are our first Advent Extravaganza winner – and a copy of ‘Adventivity’ will be on its way to you shortly!